A unique and rare truffle delight. This truffle strain was found in the wild near Tampa, Florida and has since then been cultivated for commercial use after the 1980’s. It is a great beginner’s truffle as it has all kinds of wonderful effect. You really get to experience a wide array of feelings. From euphoria and laughter, followed by a feeling of getting lost within yourself, followed by intense internal visions. Easy and Controllable Trip. If you’re a beginner, you’ll find this truffle to be quite comfortable and easy to manage. Go Through Levels Throughout the Trip. From euphoric and enhanced senses, to a bit of confusion, to being able to see things, this is the perfect trip for anyone. Rare and Unique. This truffle is found specifically in Florida and its cultivation for commercial use is not as common. Experience this delicacy of a truffle for yourself! Experience the Effects Right Away. One thing about this truffle is that you’ll notice mro intense seeing and hearing after just 10 minutes (up to an hour for some users). Unbeatable Price. For a truffle so rare and precious, you’ll be hard-pressed to find anybody else selling it for such a great price. While Tampanensis may be a bit strange to say, you’ll remember the name once you discover how much you love its effect. Try it out for yourself — order now! The active ingredient in magic truffles is psilocybin. Psilocybin is a triptamine similar in structure to our bodies, naturally produced neurotransmitter, DMT. There are no poisonous byproducts or metabolites created. Psilocybin is ridiculously non-toxic (so no hangover). 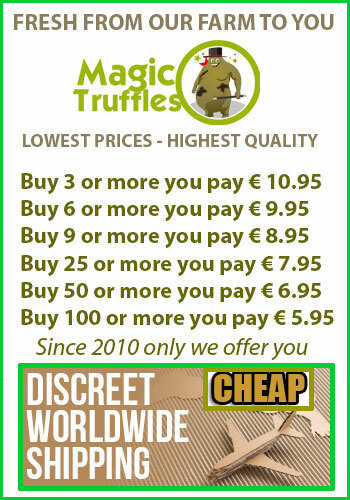 Truffles are sold fresh in a 15 grams vacuum packed quantity. So you need to keep them in the refrigerator until you use them. A sclerotium is a living product. It might be possible that air (especially CO²) might be trapped in the package. This will make the sclerotia continue to grow and white "hairs" will appear on the outside of the truffles. This is the mycelium and shows the truffles are healthy. This is edible and doens't affect the trip. Note! Start with a low dose (5 grams) of these magic truffles to check your sensitivity. We have trip reports about these psilocybe and psilocybin containing truffles . Strong psychedelic experiences and inner visions are reported in: Austria, Australia, Belgium, Canada ,Denmark, England, France, Finland, Germany, Holland, Italy, Ireland, Netherlands, Norway, Portugal, Poland, Spain, Sweden, UK, United Kingdom, United States, USA and Switzerland. Avoid using when pregnant or nursing, when depressed, on medication or in combination with stimulants or alcohol. Also avoid driving motorized vehicles. Not suitable for under 18 years old. If it’s your first time on psilocybin it’s a good idea to have a friend with experience to be with you in case you feel nauseous or anxious. Do not repeat a trip for at least a week, not because it’s dangerous but because it’s a waste of money! The body rapidly builds up a tolerance for psilocybin so taking a fresh dose too soon after the last one will have almost or no effect at all. I've taken these mild truffles a few times and never had a bad experience yet! But last time I did take a packet of tampanensis and then a full pack of atlantis at the same time.....unless your a heavy psychonaut I wouldnt recommended, Personally i think 20grams would be perfect for a strong trip, regardless great buys. Great delivery and service.thank you Buy Magic truffles! Share your experience about Tampanensis with other customers. Submit your tips or thought on this product, be detailed and specific.